Earlier today I posted a new liqueur recipe for strawberry nectarine. It was the first one I had posted in a very long time and it got me thinking about all the amazing liqueurs I had made over the last year. In that post I also mentioned that liqueurs are best after aging a month or two, and that they made great gifts. 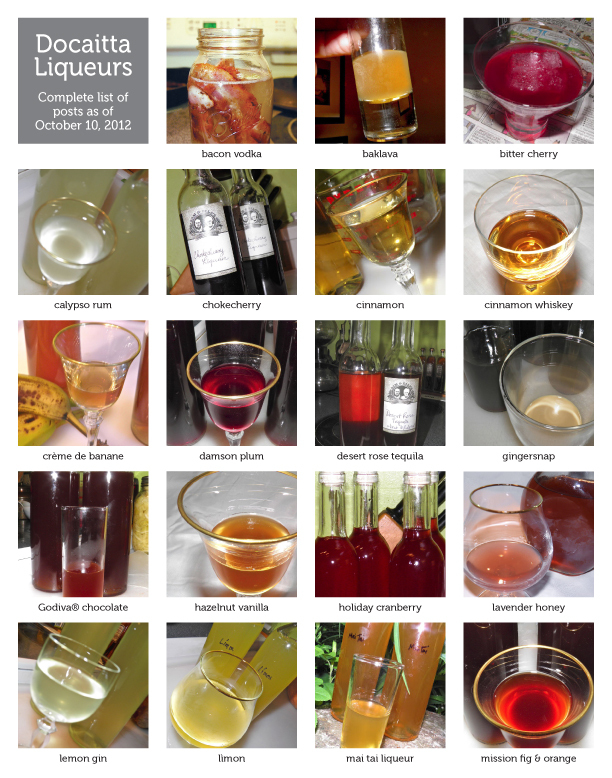 So in the interest of giving you “news you can use” I though I would post a collection of all the liqueurs I have made since I started posting – with links back to the original posts so you can make them too. Hand-dandy, and all in one spot. I do have to admit that they were a great hit last Christmas. All I did was get some cheap wooden boxes at JYSK (about $2,99) each, some stuff to fill in around them (like packaged moss or similar) and some clear cellophane. Four bottles per box and they looked gorgeous. I have made mustards, soaps and preserves as gifts before but it always seems that the booze is received with more "joy." 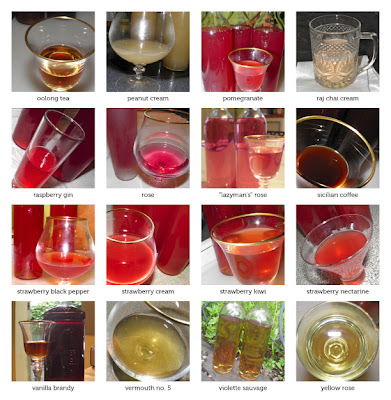 Regardless of their reception, all these liqueurs are very easy to make at home. Most use vodka as a base, but I also have whisky, rum and tequila-based recipes thrown in just for the fun of it. If you do use vodka try to get something that you wouldn’t mind drinking yourself. I prefer potato vodka. I find it far smoother than grain-based vodka. Luksusowa is the same price as "normal" vodka and can be purchased at Bishop's Cellar in Bishop's Landing on the Halifax waterfront. The photos are listed alphabetically. The recipe links are not, but all clearly state where you’re going to be directed. Enjoy, and make some booze!! wHAT IS THE SHELF LIFE OF ALL OF THESE?